Steve’s Real Food For Pets is introducing a new, all-natural treat for cats and dogs that will be available in July! This exciting new product is an all-natural frozen yogurt made with goat’s milk, chia seeds and coconut shavings. The yogurt itself derives from the milk of free-range, hormone and antibiotic free, grass fed goats. Steve’s Real Food frozen yogurt is a great addition to your pet’s diet. Dogs and cats love it so much that you can even use it as a treat! Goat’s milk is a calcium rich, natural anti-inflammatory, it is lower in fat than cow’s milk yet maintains the essential amino acids and high proteins your pet needs to remain healthy. Raw goat’s milk also provides vitamins B-12, C and B6, enzymes and beneficial bacteria naturally found in milk. The coconut can support your pet’s intestinal and digestive health. The coconut helps maintain a healthy weight and is a great source of dietary fiber. Coconut may also prevent your pet from suffering parasitic, yeast and fungal infections. While quite small, the chia seed contains enormous quantities of protein and five times the amount of calcium found in milk. 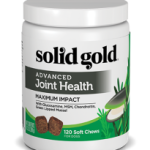 The trace mineral boron in chia seeds helps your pet absorb the calcium for strong bones and teeth. The Omega oils found in the chia seed should help regulate his blood sugar levels, allowing him to maintain a healthy weight. Chia seeds also help reduce his risk of heart disease by maintaining his blood pressure and cholesterol levels. 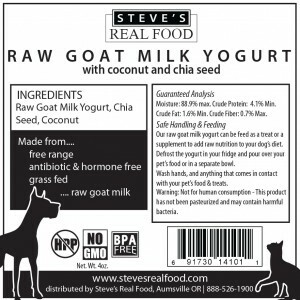 Steve’s Raw Frozen Goat’s Milk Yogurt is the perfect treat and nutritional supplement for your pet’s diet. Steve’s Real Food yogurt for dogs and cats is not high pressure pasteurized (HPP), is free of Genetically Modified Organisms (GMO). Our containers are recyclable, and Bisphenol A (BPA) free. 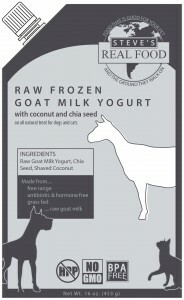 Keep your pet happy and healthy with this frozen goat’s milk yogurt! Want to learn more about raw goat’s milk? Our friends at Answers Pet Food is a wonderful source! Ask For Steve’s Real Food Yogurt at a Northland Retailer near you. We are happy to assist you in choosing products for your pet, please contact us with any questions. 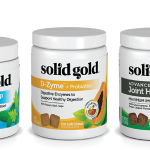 Solid Gold Northland, Inc. has been a wholesale distributor providing natural pet products and personalized customer service to pet owners, retailers and pet professionals throughout the Midwest, since 1995. We specialize in holistic and highly respected pet nutritional products that make a positive impact on pet’s health. Reading Pet Food Reviews Can Be Helpful!